Perform fast incremental forever backups. Achieve rapid recovery in minutes with multiple restore options. Clone multi-terabyte database copies in minutes. And protect data in any public cloud platform. For DBAs and IT admins, achieving the above Microsoft SQL database backup and recovery ideals aren’t just a pipe dream—they’re actually achievable. 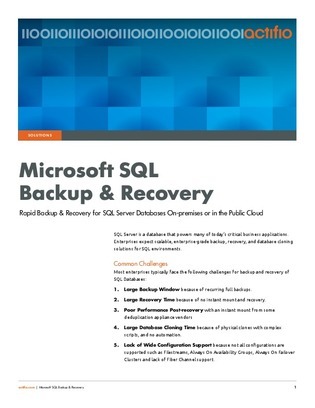 Download this paper to learn how, and to view a backup and recovery software that solves 5 critical challenges that typically plague SQL databases.